The official announcement that U.S. Sen. Jim Inhofe will leave his position as the ranking Republican on the Senate Environment and Public Works Committee is good news for anyone who cares about the environment and believes in the scientific method. Of course, that’s not how the story is getting played by the mainstream media in Oklahoma. The story here is that Inhofe is simply moving on to serve as the ranking Republican on the Senate Armed Services Committee and, by rule, must give up his other post. In NewsOK.com’s laudatory story, Washington correspondent Chris Casteel pointed out that the new appointment will give “military-rich Oklahoma influence over Pentagon spending and policy at a time of tightening budgets.” Casteel, who serves as a de facto public relations operative for Inhofe, didn’t even mention how controversial Inhofe has been considered throughout the years for his opposition to climate-change science as a member of the EPW Committee. 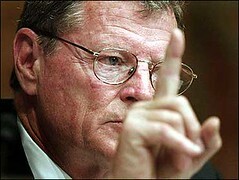 That misguided and unethical opposition, which only served the interests of oil and gas companies, and Inhofe’s infamous, ludicrous claim that global warming is a hoax created by liberal environmentalists will be his only legacy from serving as the ranking Republican member and a former chairman of the EPW Committee. The Senate’s GOP caucus limits its members to six years as chairman and six as ranking member. So while Inhofe could serve another two years as chairman, if Republicans remain in the minority he will be pushed out [italics mine] and is expected to take the top Republican spot on the Senate Armed Services Committee. Note the phrase “he will be pushed out.” It seems plausible that the Republican losses in national elections last November might have Republicans rethinking Inhofe’s controversial style of alienation and accusation when it comes to issues related to the environment. For example, during her campaign, U.S. Sen. Elizabeth Warren, a Democrat, pointed out Inhofe as a clear case of Republican extremism, and she won her seat handily against a Republican incumbent. Whatever the reason given for Inhofe’s switch, there is real cause to celebrate the announcement. U.S. Sen. David Vitter of Louisiana is expected to become the top ranking Republican on the EPW Committee, and it’s unlikely he can follow or emulate Inhofe’s extremism. The question, of course, is whether he even wants to adopt extremist, anti-science positions, especially given the relatively recent oil spill accident in the Gulf Coast. Meanwhile, the signs of global warming are all around us. The annual temperature data collected by the National Weather Service is starting to surface for 2012, and it appears some areas of the country have officially experienced a record high average temperature. In fact, experts are predicting the nation’s lower 48 states have just experienced their overall warmest year in recorded history. The country’s Midwest region remains in a severe drought. The Arctic ice melt this season set a record. Rising sea levels have been blamed for the power of Hurricane Sandy, which caused at least $60 billion in damages. Global warming, accelerated by manmade carbon emissions, is a fact that needs to be addressed seriously for the survival of the planet. Limiting Jim Inhofe’s soapbox will help us do so.